The Performing Arts Academy is a drama and performance training project for learning disabled actors. It’s aimed at people over 18 years old, who have a passion for performance. The training is delivered by creating completely original new productions, where the ideas are devised by the participants in the group. We don’t produce shows from existing scripts. The project supports people to build their confidence, to work as a creative team and to find their creative voices. We are keen to raise the profiles of disabled people in the arts. The project is on every Friday from 9.30am-3.00pm, including through the summer, and we are working towards a production for ARC’s main theatre stage in November. It’s important to be able to attend every week to be able to take part in the show. The training is tailored to the participants in the group. 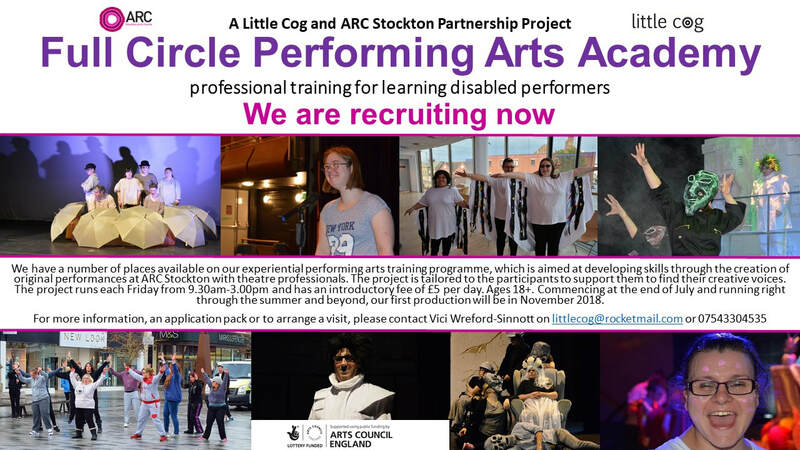 The project is designed and facilitated by award winning theatre director and playwright Vici Wreford-Sinnott, with a support practitioner, and additional guest practitioners, along with the technical and management team at ARC. It’s a great opportunity to develop skills in a professional setting. We have six places available for newcomers to join six existing participants. Ideally you might have already have some drama experience or alternatively just have a passion to learn and perform. You will be keen to have your say about the world using theatre. The project is funded until March 2019 but we will be seeking continuation funding if the demand is there. Until March the introductory weekly fee is £5.00 to be paid to Box Office each morning on arrival. We have a support worker to support the overall project but if you require one to one support you would need to provide that. How do I get a place? We like to welcome people as informally as possible, but of course we need to know that it’s the right thing for you and, more importantly, you need to know that too. We welcome people to visit on a Friday, but you must arange this in advance using the contact details below, to have a chat and to either observe or join in with a session. You can do that in July with a view to starting soon if you like it, and we feel that you will get something out of what we’re offering. Please note that you can't just turn up - you need to contact us first and have an agreed time to visit. Get in touch soon though as places are likely to go quickly. We have an application form which is really about sharing information with us about yourself. If you get offered a place, we have an admissions process which we will support you through, but again is just about sharing information confidentially. Want a form and to come for a visit? The application and equality forms are below, and you can email or ring Vici on littlecog@rocketmail.com or 07543304535. You'll need to send us the forms before your visit.